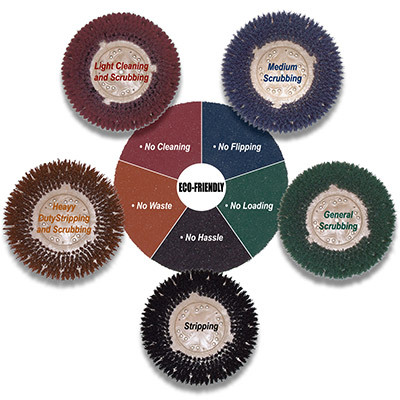 May 2013 – The Malish Corporation, a world leader in the manufacture of rotary/disc brushes, hand maintenance brushes, and the Diamabrush By Malish Floor Preparation System, now provides reference guides and recommendations on its website to assist in making the selection of the proper brush for different cleaning applications. Whether the question is about the best brush or pad driver to use or how to select the appropriate brush diameter size or which brushes work best on specific cleaning surfaces, Malish makes it easy to choose the best brush for the application. The Rotary Brush Frequently Asked Questions (FAQ) page of the Malish website identifies basic information and questions to ask when determining what is the best brush for the best end results in cleaning. Using a question and answer format, basics of proper brush selection for specific cleaning tasks are identified with links provided to charts or other areas on the site that detail information. Other discussions include how to determine the correct diameter of a brush and what type of brush fiber is the proper selection for specific applications. The Cleaning Applications chart provides a ready reference for brush type selection. The Malish Corporation also offers its Color Coded Grit Rotary Brush Solution to visitors of its website. This tool helps match floor pads to the right brush. Different colors are used to link the correct brush type to use for specific cleaning tasks. Whether the job is stripping (black) or general scrubbing (green), the precise brush information including brush diameter and grit size provides a quick reference for selecting the right brush to meet specific cleaning challenges. The Malish Corporation is a world leader in the manufacture of rotary/disc brushes and accessories and hand maintenance brushes. The company also markets the Diamabrush By Malish line of floor preparation equipment and is a custom extruder of thermoplastics tubes and profiles through its Malish Plastics division. Founded in 1948, the company operates a manufacturing facility at its headquarters in Willoughby, Ohio, USA as well as in Dongguan City, Guangdong, China. There is also a sales and distribution center located in Utrecht, The Netherlands.